The use of lead and graphite which gives the effect of gray streaks started in Greece. In the year 1564 discovered a pure graphite content in large numbers in northern England. Although it looks like coal, graphite can not be burned, and shiny black scars and easily removed. In the days are still confused with graphite lead and Plumbago. 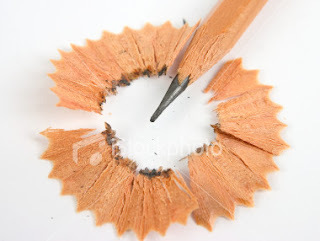 That is why the term pencil (pencil lead) is still used today. Because graphite oily, previously wrapped with small pieces of sheep skin or rod-shaped tin is wrapped with rope. It is not known with certainty who originally entered the graphite into the pencil-shaped wooden container so that we know today. However, in 1560, a pencil with a primitive form already exists in continental Europe. Graphite and then exported to the artists, and in the 17th century can be said graphite has been used everywhere. Pencil makers experiment with graphite to create a better desktop. With graphite in something so precious and the target of thieves, in 1752 the British Parliament passed a law which States that a thief of graphite. In 1789, graphite name derived from Greek official graphein provided, thus eliminating the confusion between the graphite lead. In the making of the modern pencil, pure graphite used in a manner mixed with clay.